Ayako Iino (that’s her young son Kai peeking out from behind) with jars of her umeboshi, aka umesu vinegar, and deliciously sweet ume-peach preserve. 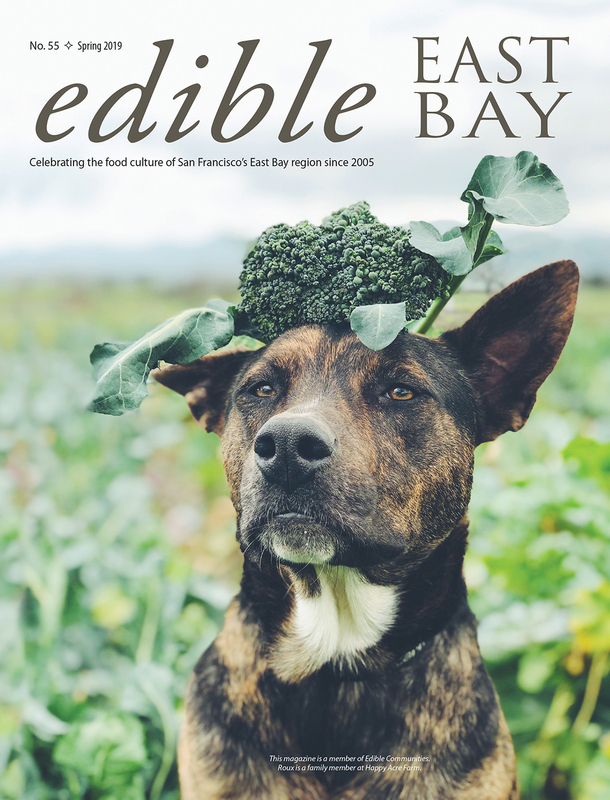 If you’ve spent any time looking around the shelves at Monterey Market, the Local Butcher, Berkeley Bowl, Three Stone Hearth, or online at Good Eggs, you may have noticed some pretty jars with very simple calligraphed white labels reading “ume boshi.” Filled with umeboshi, a salty, slightly sour pickled plum with wrinkly skin, the jars are from Ayako Iino, a culinary school graduate and alumna of both Oliveto and Boulettes Larder, who lives with her family in a bright, airy home in South Berkeley. Her company name is, aptly, Yumé Boshi. Recipes for the fruit ferment, a Japanese pantry staple, are as varied as those for dill pickles, which makes the delicate taste Iino achieves with simple ingredients—locally grown fruit, sea salt, and red shiso leaves—especially intriguing. Iino grew up in Japan watching her mother make traditional Japanese pickles and preserves, including umeboshi. She eventually began making them herself. After settling in California, Iino was delighted to find a farmer in the Central Valley growing Prunus mume, an Asian tree species more closely related to the apricot, which produces the traditional ume “plum.” The tree’s soft-pink, deeply fragrant spring blossoms give way to fruits with a light yellow-green skin. Finding the traditional ume inspired Iino to return to making umeboshi and other ume products. One of Iino’s succulent pickled plums, ready to eat! Preparing umeboshi starts in late May or June, when the fruit is harvested firm, green, and unripe. Iino uses sea salt to draw moisture out of the plums, retaining the liquid that drains off to use in making her aka umesu, a sweet and fruity red plum vinegar that’s good for dribbling on vegetables and salads. Once the skin of the fruit has started to wrinkle, Iino lays out the plums on racks to sun-dry them for several days. Drying softens and tenderizes the fruit, contributing to its subtle and complex flavor. After drying, the fruit is placed in buckets where the pickles will mature through the summer. To the buckets she also adds fresh leaves from the red shiso plant, a Japanese herb of the mint family, which she sources from a local farmer who grows it for her using seeds saved from the previous year. The leaves react with the brine to give the fruits the deep pink color Iino is particularly proud of. Iino usually jars the pickles around mid-to-late August. The fermented plums are moist (not juicy or wet), with a distinct fruitiness and hints of anise and cinnamon from the shiso. The finished fruit smells like ripe cherries, and the salty and tart taste that characterizes umeboshi is particularly nuanced. 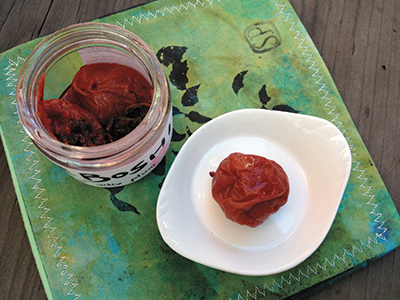 In 2014, Iino produced about 600 jars of umeboshi. 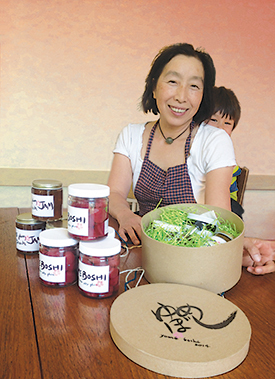 This year, she’s more than doubled her output, as well as that of her ume vinegar and specialty preserves. For her ume-peach jam, Iino sources yellow peaches—June Pride, Rich Lady, and Flavorcrest—from Woodleaf Farm in Oroville. June Pride has a reddish color which, together with organic sugar, gives the jam a dark orange color. The fermented umeboshi pickle is thought to have many healthful properties, in part due to its alkaline quality, which neutralizes acidity and aids digestion. A traditional part of a Japanese breakfast, umeboshi are typically served as a condiment on warm, steamed rice; inside an onigiri rice ball; stirred into miso, tea, or porridge; or as an accompaniment to a meal. A delightful traditional Japanese plum condiment!